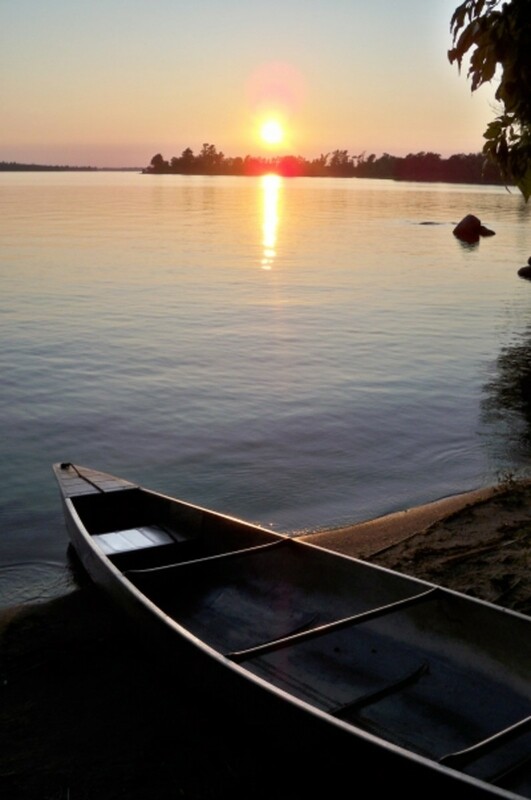 While paddling close to shore one evening, looking for wildlife as the setting sun created artwork on the surface of the still lake, my husband commented with a smile, "If it weren't for the mosquitoes, the biting flies, the gnat swarms and the leaches, this place would be overrun with people. Actually, it wouldn't. 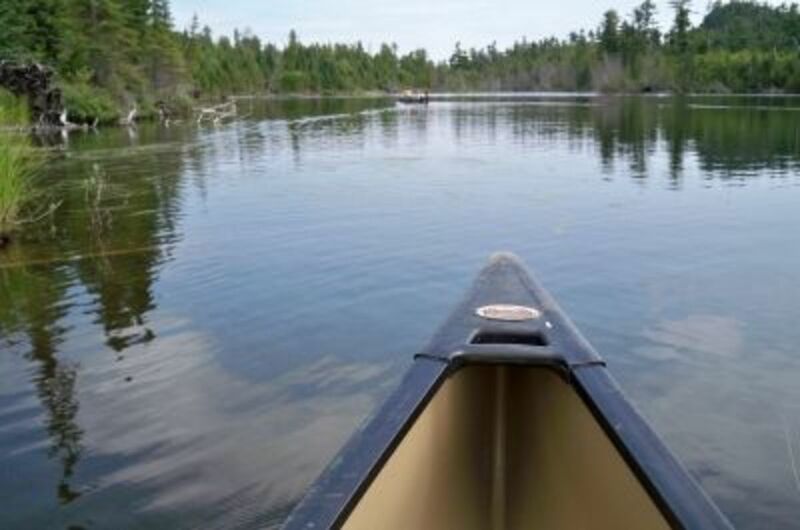 That's what the permit system is for -- to limit the number of people in northern Minnesota's Boundary Waters Canoe Area Wilderness, so solitude is sure to be part of any BWCAW canoe-camping experience. Solitude, silence and the calls of the loons, the howls of wolves, and other abundant wildlife, pristine waters teeming with fish, thick forests in all shades of green, and time to slow down, breathe the fresh air and get in touch with yourself for a while -- those are just some of the things I love about the land of 10,000 lakes and why I proposed this trip, my second time to the area. 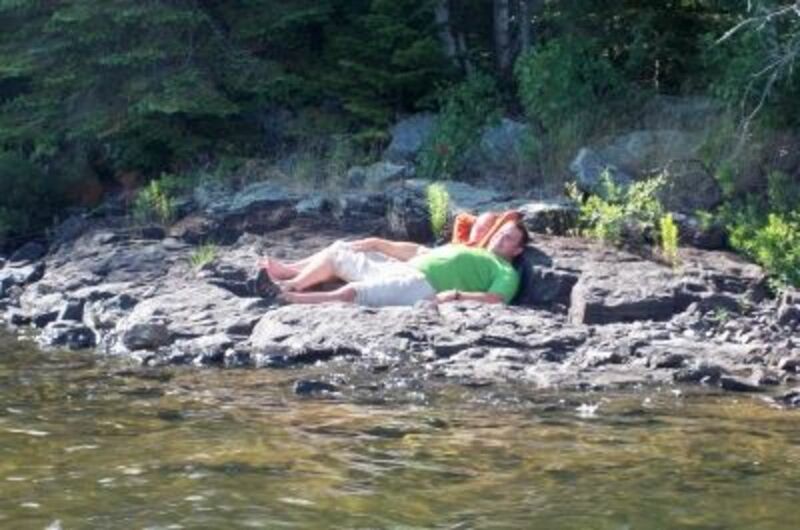 On August 1st, my husband and I and two other couples rendezvoused along the North Shore of Lake Superior then headed west to Gunflint Outfitters, where we'd begin our BWCAW canoe-camping trip the next morning. Here, I'll share with you some information about our Boundary Waters trip and a handful of the many photos I took along the way. There are also links throughout the page for more information on related subjects. Have you visited this area? 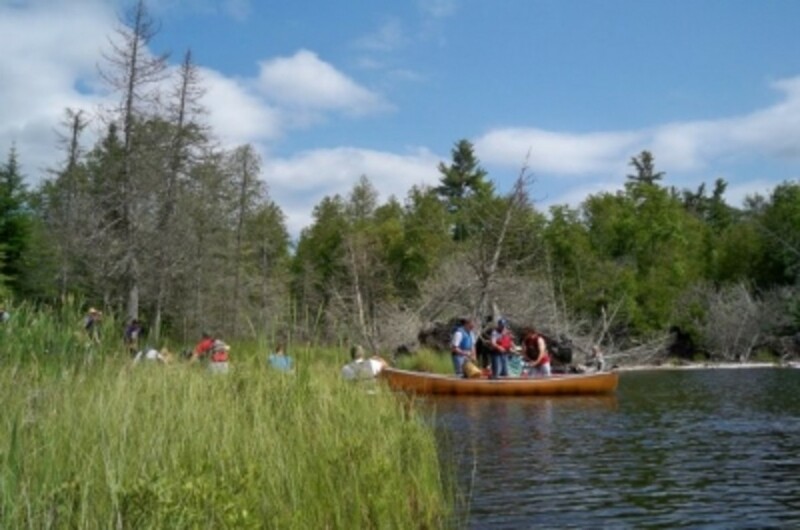 The BWCAW isn't a place I'd go canoeing, canoe-camping or hiking without a good guide and maps. There's just nothing out there -- and not many people -- to help you if you get "misplaced." So have a good plan, let someone (like an outfitter) know your itinerary, be prepared to navigate and have a great time in a gem of a wilderness. Here are some excellent guides, including a BWCAW trip planner, a canoe-camping guide, and a map bundle. The last two guides in this list divide the Boundary Waters into eastern and western regions for more detailed information. We used these ourselves and were glad we did. This map pack includes Boundary Waters Canoe Area East and Boundary Waters Canoe Area West, printed on waterproof, tear-resistant material. 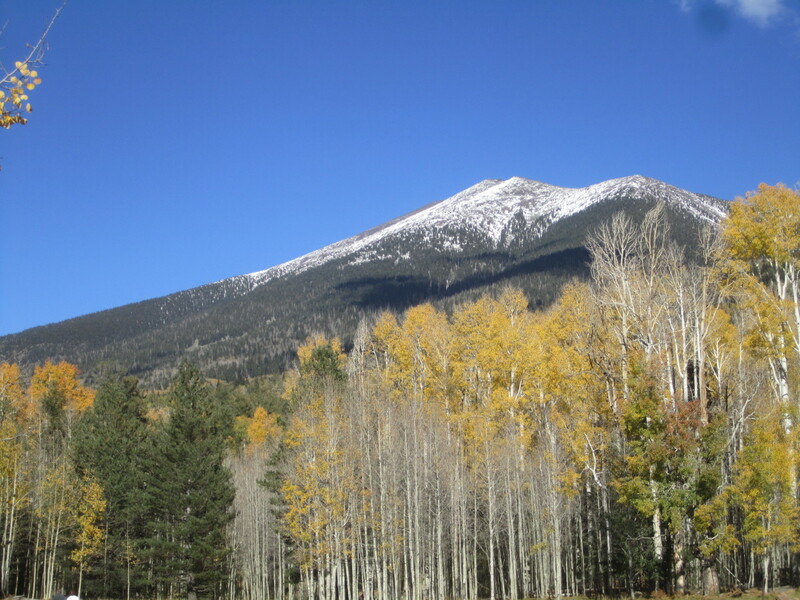 This detailed topographic recreation maps contain trails, campsites, forest service roads, and points-of-interest, with UTM grids for use with your GPS. Six years ago, I met Bonnie and Cheryl at Gunflint, when my hiking partner and I decided to paddle part of our intended route rather than risk getting lost on the remote, unmarked and often obscure Border Route Trail. These two knowledgeable, capable women were very helpful in outfitting us for our canoe trip, obtaining the last-minute permit, providing us with maps for our route, and picking up the canoe (along with a surprise delivery of fresh strawberries) when we left the water a week later to hike the well-maintained Superior Trail. I thoroughly enjoyed the paddling and portaging and knew I'd eventually return for more. This August 1st, the moment we turned off of Highway 61 at Grand Marais and started up the Gunflint Trail (a remote, scenic road), I smiled. Even the trees seemed familiar. And when we pulled up to the outfitters 46 miles later, nothing appeared to have changed, not even Bonnie and Cheryl, who both remembered my visit six years earlier in amazing detail. The next morning, after my travel companions and I had a tasty dinner down at the lodge and spent a night in the canoer cabins, we finished organizing our gear, transferring canned foods to reusable plastic containers (because cans aren't allowed in the Boundary Waters--read the BWCAW rules) and watched the Boundary Waters Leave No Trace video. Then Bonnie issued us our permit, fitted us for PFDs and paddles, and we loaded our gear and boats for the shuttle to our entry point on Bearskin Lake. 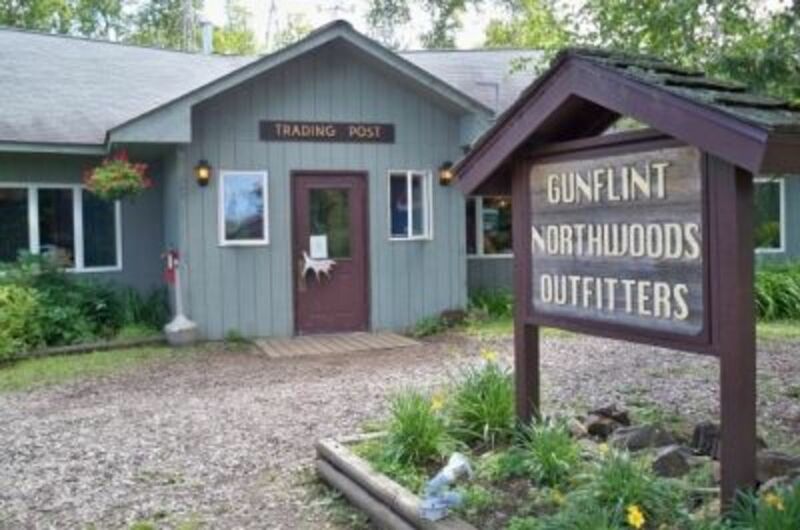 For more information on Gunflint Outfitters, open year-round, visit their website at GunflintOutfitters.com or call 1-888-CANOEING. 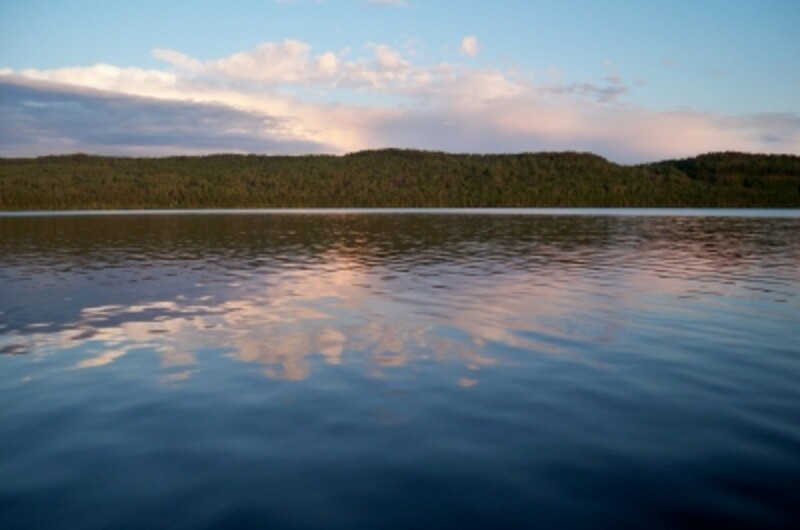 Gunflint Outfitters and Gunflint Lodge on the shores of ... you guessed it: Gunflint Lake. I highly recommend these folks. Bonnie sizes us up for canoe paddles. Well, it wasn't really a full loop, so the trip required a shuttle from Gunflint Outfitters to our put-in at Bearskin Lake, about a half-hour drive. The shuttle, including transporting our boats and gear was provided by Gunflint Outfitters for $25 (total, that is, not per person). Our canoe route was roughly 23 miles long, including the six portages but not including additional paddling we did in the various lakes to and from campsites and while fishing and sightseeing. We finished the trip when we paddled up to the beach back at Gunflint Lodge. We planned five days for our trip, which allowed us ample time to explore the lakes by boat, relax in camp, do some hiking and fishing, and spend two nights on Rose Lake. The day we spent there was very windy, so we were glad not to have to paddle. 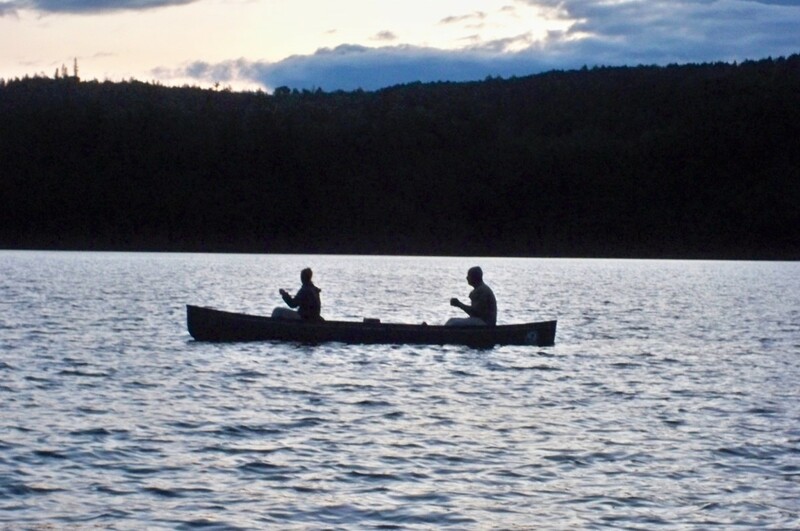 That evening, the wind died down, and we enjoyed a sunset canoe. 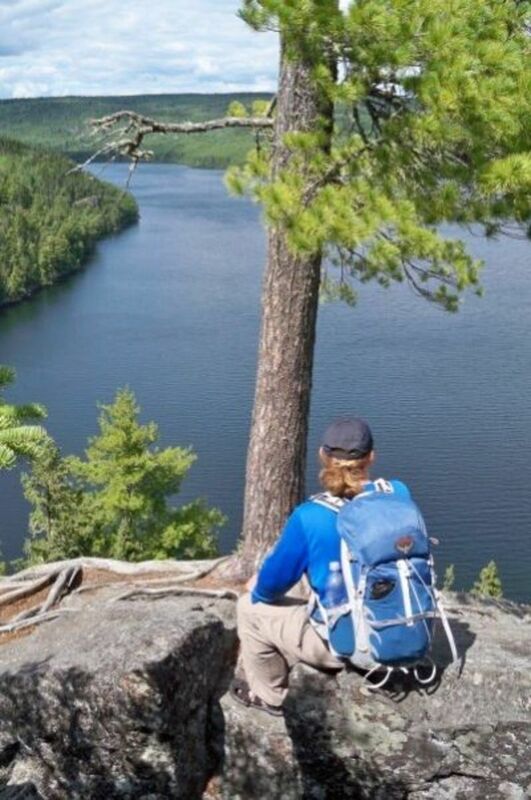 There are countless routes to choose from in the Boundary Waters, so you can really tailor your trip to suit your goals, abilities and time frame. Routes might include no portages at all or perhaps many portages, short and/or long. You might simply stay on one lake and explore it to your heart's content. If fishing is your thing, you might want a low-mileage route with plenty of time in each spot. Or maybe you're more the voyageur type who likes to cover a lot of distance. Whatever your preferences are, there will be a route out there to satisfy you. 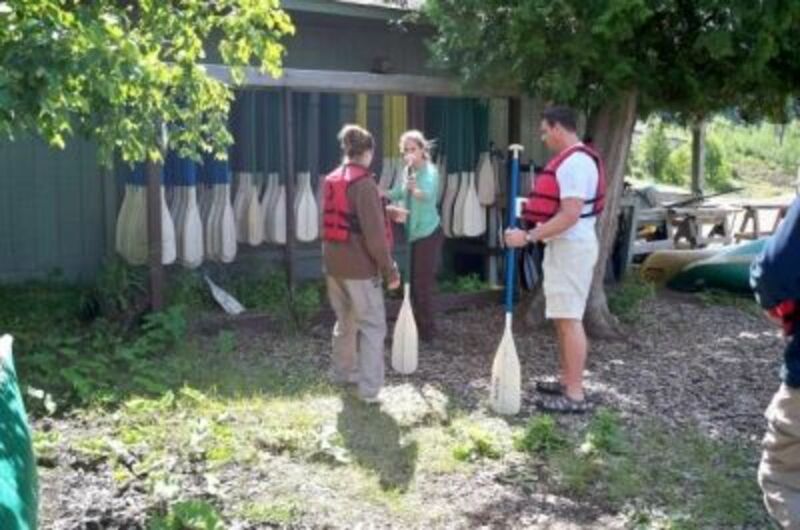 (Our next one will be more in the adventure-travel category, when we plan to paddle and portage more than 200 miles from International Falls to Grand Portage along the historic Voyageurs Route.) The local outfitters and guide services can help you select a route that's right for you. I recommend using Fisher maps for Boundary Waters canoeing and camping. We had three boats and six people in our group. The maximum allowed per group is nine people and four boats. The lakes were often calm in the morning and evening, but the wind usually picked up by midday. The portages, measured in rods with 1 rod equaling 16.5 feet, ranged from 4 to 80 rods on this trip. 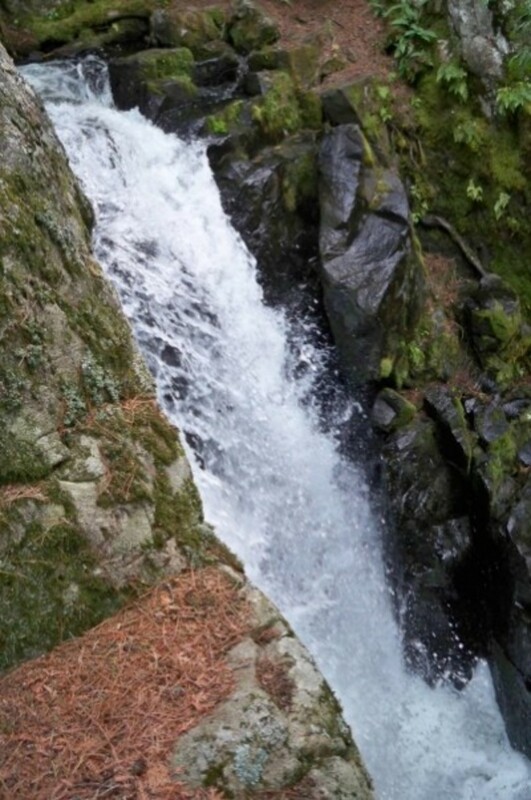 The challenging "Stairway Portage" between Duncan and Rose Lake literally included more than 100 wooden steps as you descend alongside a beautiful cascade. We brought quite a lot of gear, including coolers with ice for perishable food, making the portages challenging and usually requiring two trips by each of us. You can certainly make portaging easier by packing much as you would for backpacking. 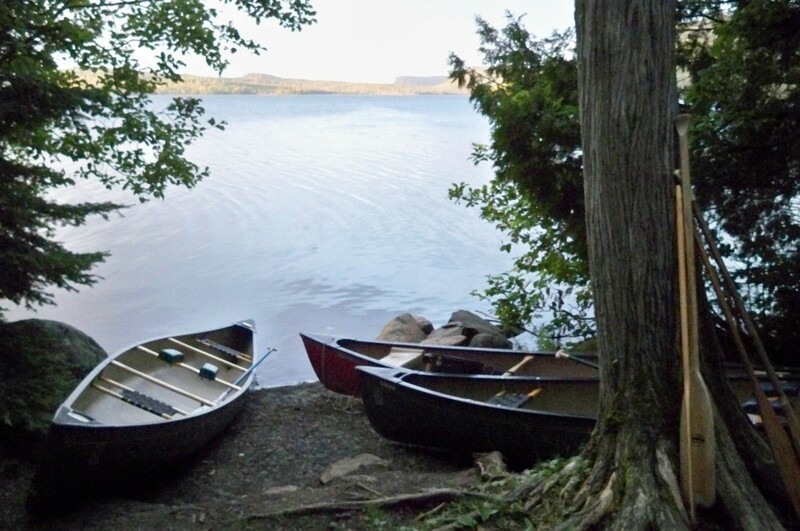 This would be a good idea if doing a canoe route with longer portages, such as the 660-rod (two-mile) "Long Portage" at the east end of Rose Lake. The etiquette on portages is that you allow anyone already on the portage or approaching it ahead of you to complete the portage before landing your watercraft and unloading. 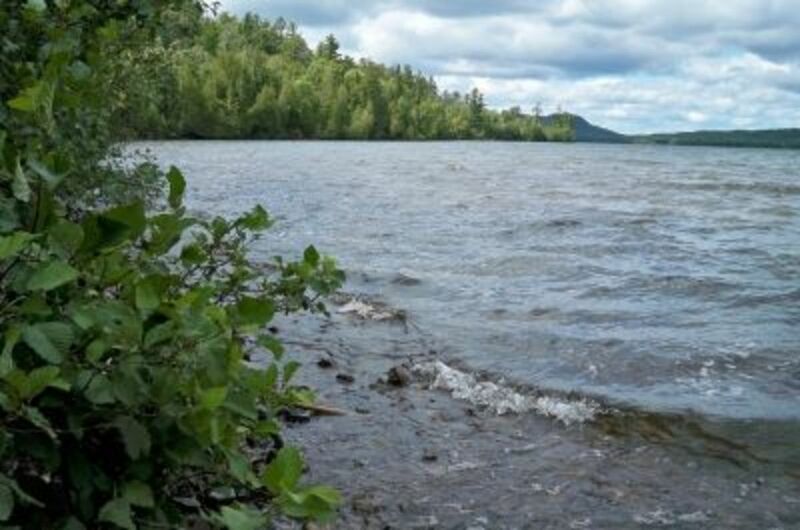 According to the permit rules, there can be no more than nine people at any one place in the Boundary Waters, including campsites, on the water and on portage trails. A bit of a bottleneck at a portage. This doesn't happen often and sometimes never on the more remote lakes. 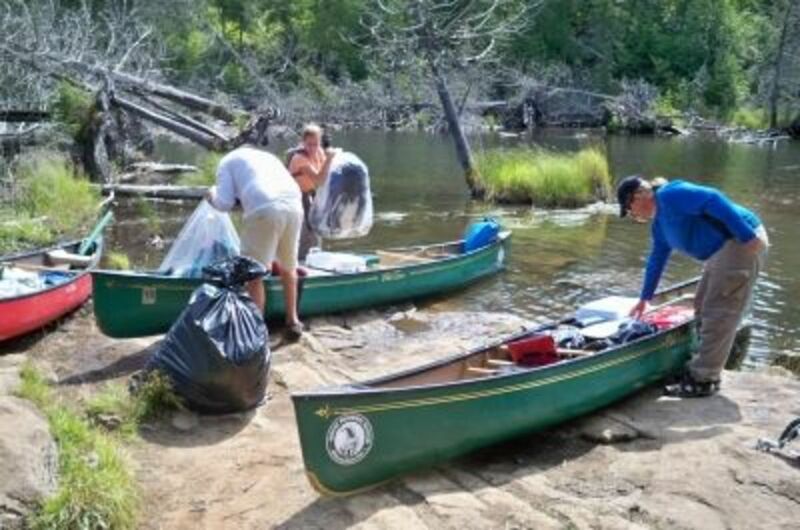 Camp at designated sites and practice "Leave No Trace"
In the BWCAW, you have to camp either at one of the sites designated by a U.S. Forest Service fire grate and latrine or within "designated Primitive Management Areas" specifically approved on your permit. The Fisher Maps have the designated campsites indicated with red dots. Camping is on a first-come, first-served basis, so it's advisable to get on the the water early in the morning if you're moving on and set up camp fairly early in the afternoon. But it really depends on the season and the lake. When I was in the Boundary Waters in early June, 2003, my travel companion and I saw only 2 other boats and always had our choice of campsites. This time around, in August, 2009, we saw other people every day and sometimes the first sites we looked at were occupied. 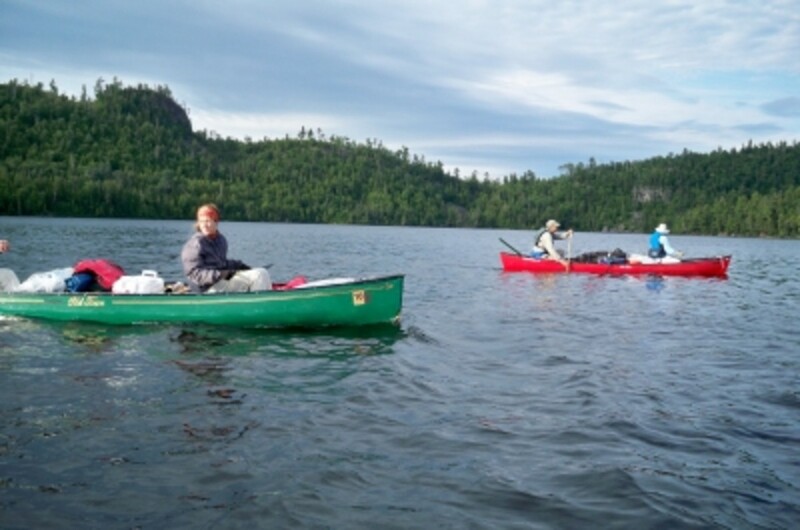 Nonetheless, the permit system helps ensure you'll find a site without too much trouble, though you sometimes might have to paddle (and maybe even portage) further than you'd anticipated to find one that's open, especially during the more popular mid- to late summer season and on the less remote lakes. One thing's for sure, though: you'll always have a lake view! Even sometimes from the potty. 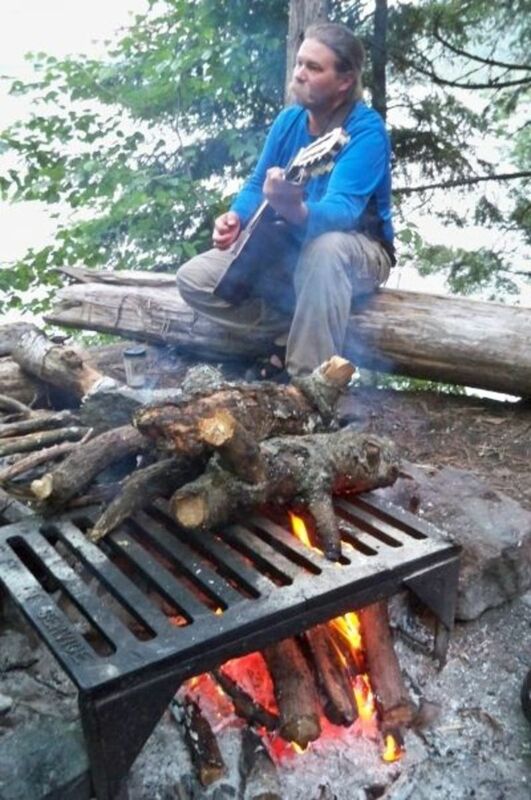 Steve plays us a tune around the campfire. You can collect wood as long as it's away from shore, dead and no longer standing. 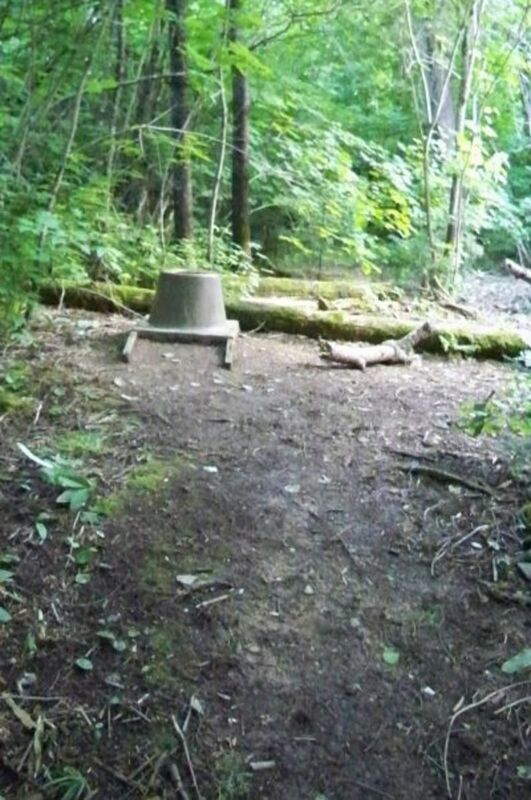 Each campsite has an open-air, pit potty, complete with backside biting mosquitoes in the summer. There's something about food cooked over a campfire or on a camp stove that makes it taste so much better than it does at home, no matter how basic (and sometimes flawed) the recipe might be. On our trip, though it meant a heavier load than if were eating backpacking-type food and more to carry on the portages, we decided to bring some fresh and perishable food in coolers and go "gourmet," at least for dinners. For breakfasts, some of us had cold cereal/granola with rehydrated milk and fresh fruit, while others had oatmeal. Lunches were various types of sandwiches, some on sliced bread and some on bagels, with various fruits and snacks. We had a treat one day, when my father-in-law caught some small-mouth Bass, which were fried up with a coating a potato buds. Again, our food could have been much more compact and a lot lighter if we'd gone with more traditional backpackers meals--dehydrated stuff like Ramen, Knorr pasta and rice dishes, and Mountain House meals--but we opted to go with the two-burner Coleman stove, coolers, and the Dutch oven and make multiple portage trips. 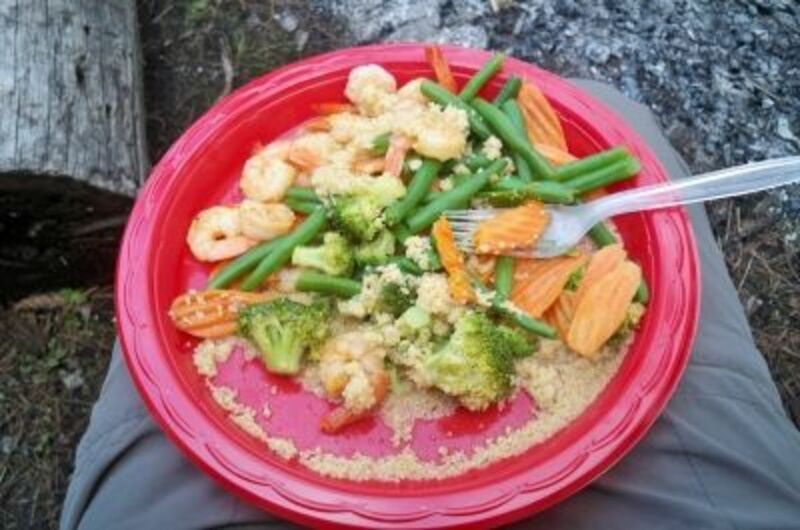 Shrimp and veggies over cous cous--bon appetit! We had to have a beanies and weanies night. 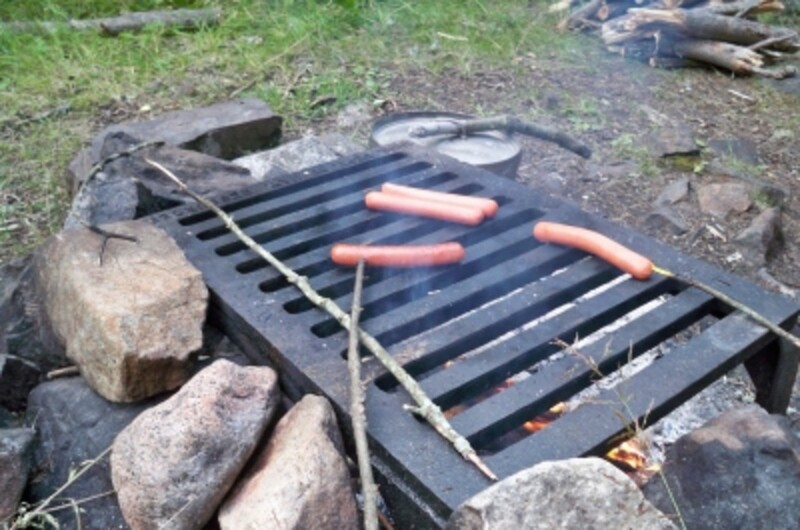 I never eat this meal at home, but it sure tasted good in the Boundary Waters. So we started out from camp, bushwhacking east along the shore towards the two-mile Long Portage (not on our canoe route), where there's a creek that separates the United States from Canada. 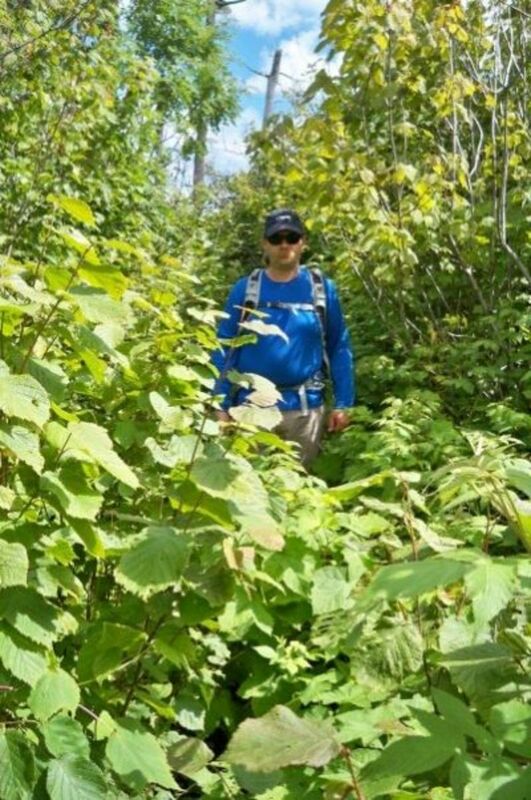 But the bushwhacking wasn't all that difficult, since it appeared we were following what may have been the old path of the Border Route Trail though that area. 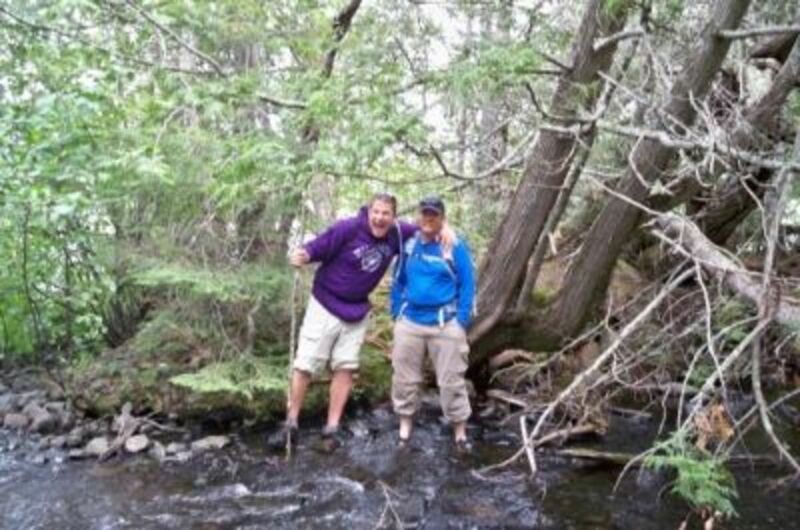 When we reached the Long Portage and the creek next to it, we all waded through and crossed the border. So we were basically illegal immigrants for about five minutes in the middle of the wilderness. Then Steve and I decided to take the longer way back to camp, along the current Border Route Trail, looping around above our campsite and coming out along the portage we'd done the day before to the west of camp, while the others returned the way we'd come. At times, the BRT was pretty easy to follow. And then it closed in, becoming more like swimming through thick brush rather than hiking, with just a faint footpath barely visible at best beneath the green mass. When we neared the portage we'd crossed from Duncan into Rose Lake alongside an impressive cascade, the trail opened up and we enjoyed a break at an overlook before descending to the waterfall and portage. From there, we bushwhacked along the shore to our camp, which was much more difficult on that part of the lake than it had been on the other side our campsite. Looking back towards camp from the end of the Long Portage. Camp is aways around that farthest point. Steve on the Border Route Trail on our way back to camp. Yes, there's actually a trail under there. 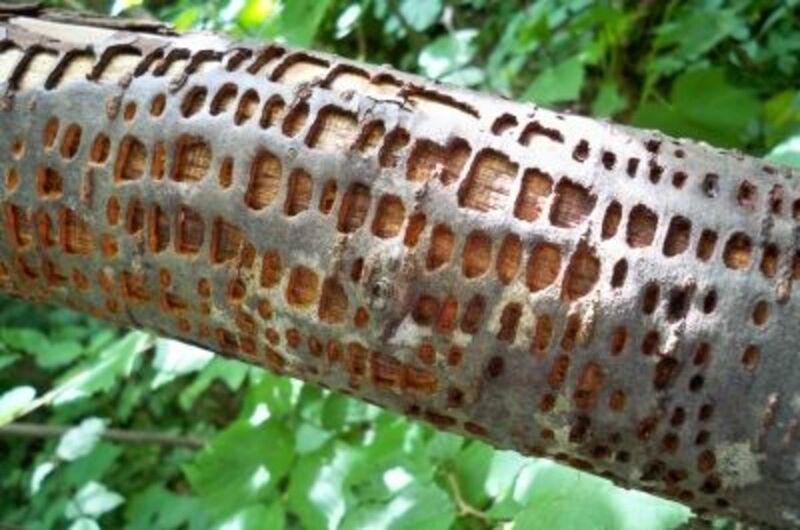 The photo below of the branch pattern made by the yellow-bellied sapsucker won the August photo contest on BWCABoard.com! 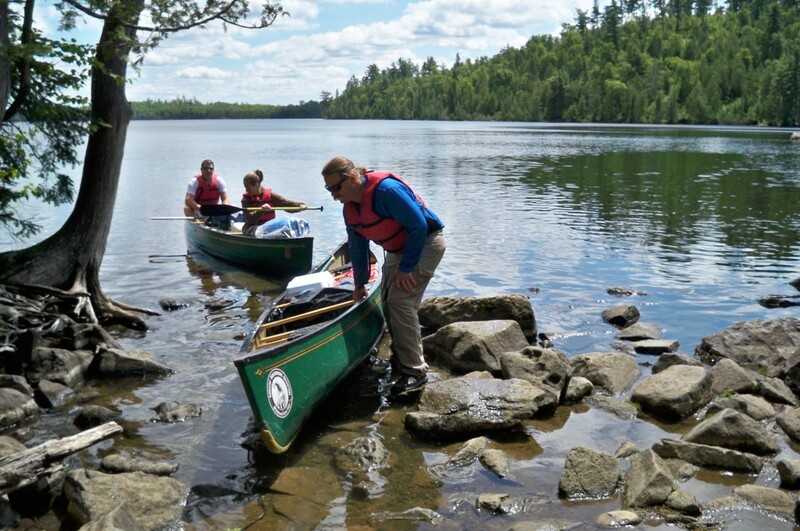 Comes with some nice prizes too, like free canoe rental in the Boundary Waters. Now we're definitely going back next year. Woo-hooo! A neat pattern on a tree on the BRT. I've since learned this was done by a yellow-bellied sapsucker. An overlook above Rose Lake. We stopped here before hiking down to the waterfall at Stairway Portage. The Falls at Stairway Portage between Duncan and Rose Lakes. From here, we headed east along the shore back to camp. I enjoy reading about the places I visit while I'm actually there. Since we were paddling part of the historic Voyageurs Route used by the fur traders in the 1700s and 1800s, I decided to choose a book about canoeing the entire distance. In 1958, author and nature photographer J. Arnold Bolz, his wife, Belva, and their friend, Harvi, carried their boat and gear from Lake Superior across the 8.5-mile Grand Portage and then paddled and portaged another 200 miles along the U.S./Canadian border to Rainy Lake near International Falls. 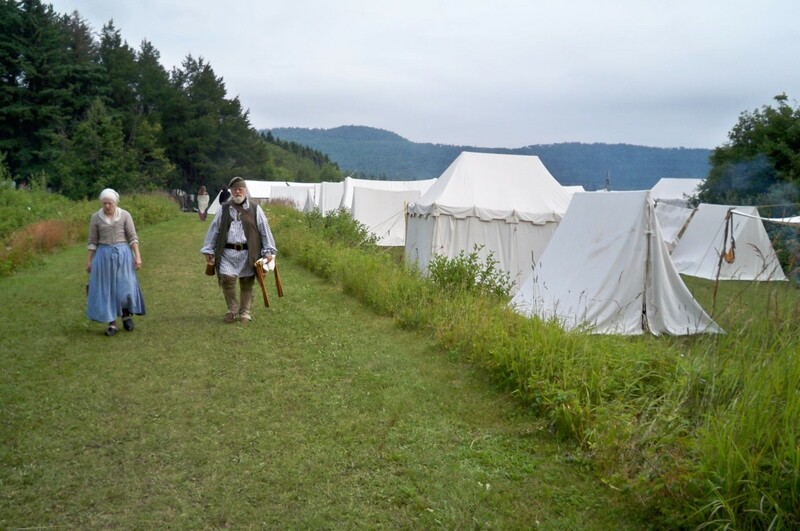 Along the way, they read excerpts from old journals written by the fur traders about the places and portages they were passing through two centuries later. I really enjoyed the book, in part because I was seeing some of the places I was reading about at the same time. It was interesting to read the excerpts from journals written by the voyageurs two or more centuries ago, though the language is often a bit archaic. Still, you can get the gist of even the most archaic passages. The author, his wife and friend were really interested in the historic nature of their canoe trip along the Voyageur's route, which added an interesting element to this book, not just an account of their own adventure. Being in Search & Rescue myself, I'm naturally interested in stories about those who get lost in the backcountry, in the events or decisions that led to their predicaments, and how they survived and were found (or found themselves). It's crossed my mind a number of times--how easy it would be to get lost in the thick North Woods, often without significant landmarks to aid in navigation, especially if one ventures off the beaten path--not that there are many beaten paths in the Boundary Waters that aren't popular portages--without maps and a compass and solid orienteering skills. In fact, a friend of mine and I got quite confused about our location and our route ahead when we hiked Minnesota's Kekekabic Trail in 2003 and, at one point, backtracked close to ten miles just to get to a point we were sure of. So I could relate to this book. And though I knew that both young men--who got lost at different times, not together--survived to tell their stories, that didn't lessen the impact of those stories or the suspense. I think this is a well-written book that moves along at a great pace. Nearly everywhere we went in the Boundary Waters area, from Grand Portage, Grand Marais and the Gunflint Trail to Ely and Voyageurs National Park, we saw this book on store and outfitter shelves and the Root Beer Lady image on bottles of the bubbly. This is the story of legendary woman of the wilderness, Dorothy Molter, also known as the Nightengale of the Wilderness (after Florence Nightingale) for her nursing skills and the help, both medical and otherwise, she gave to those who visited her Boundary Waters "resort," Isle of Pines, on Knife Lake, where she lived since the 1920s. 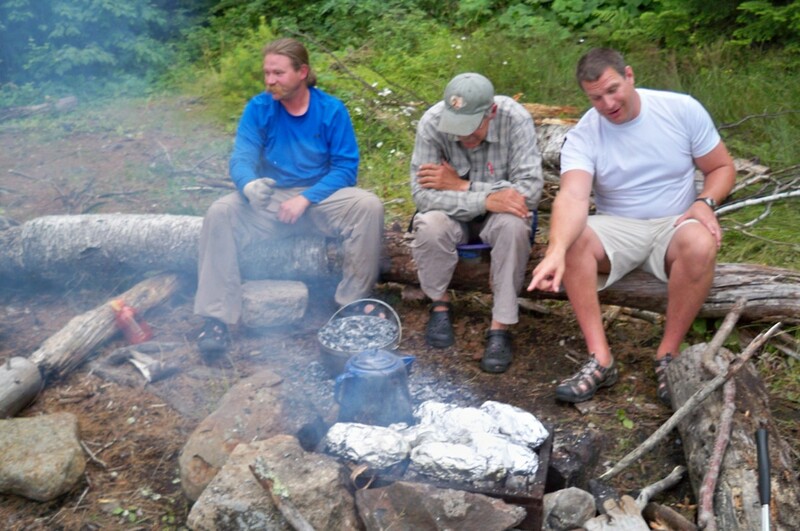 Lots of information about wilderness canoe camping in Quetico Park and the Boundary Waters Canoe Area Wilderness, along with camping recipes, campfire stories, portages and routes, fishing tips and a LOT more. Keep up with what's going on in the Boundary Waters and the surrounding area. Written by the owners of Voyageur Canoe Outfitters at the end of Minnesota's Gunflint Trail. No, but after reading this wonderful Purple Star Lens I am surely wanting to go there. Love the great photos too. great photos! I'm glad to see it has yet to turn into a Tourist-heavy locale. Long may it continue! I've been 4 times, and it's been fantastic as long as the weather wasn't too rainy. Memories came flooding back with all your photos, sights and sounds. The American side has much less roughing it than the Canadian side; I've done both, but it was nice to have actual potties in America rather than just finding a convenient place on your own in Canada. This was back in the late 80's/early 90's, but we used Tom &amp; Woods Outfitters on Moose Lake. They did a great job. Fantastic lens! No I haven't, it would be a nice place to enjoy a relaxing holiday with nature. 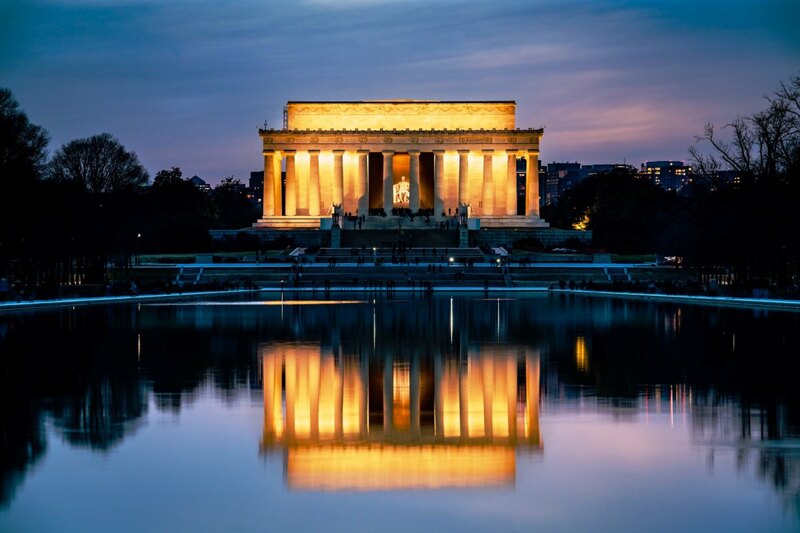 Very nice photos enjoyed traveling with you on your journey with this interesting article. Great lens and photos! Steve is NUTs to take a guitar out on the water - maybe it's an old beater? Great photos and trip guide; really enjoyed reading about it. Big congrats for your contest-winning photo. Keep it up. No, but it certainly looks like a delightful place to spend a day or a week. While I spend most of my time to the north of the Boundary Waters is its sister park, Quetico, both are an incredible experience. And thanks for sharing yours. I love the Boundary Waters. These pictures look beautiful. Never been there, but I love canoeing. This looks like an excellent trip. Beautiful pictures there is nothing better than nature! One of the most beautiful places in the U.S. Thanks for this detailed information! So proud of you. Another excellent adventure. I just feel good stopping by here again. Still wish I had warn you about the mosquitoes before you left on your trip. 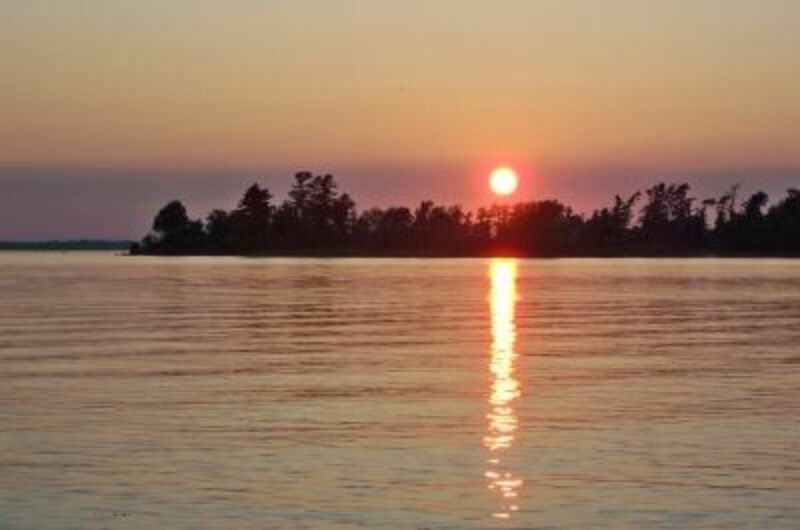 I love the BWCA, its very close to where I grew up at Kabetogama Lake. I went here as a child with my family. Thanks so much for this lens. All the photos brought back so many memories! My dad and I did the Quetico (Canadian side of the BWCA) this summer as part of a Boy Scout crew. Portaging is SOOO much fun with 85 lb canoes. Lots of 'squiters and flies, but it was an awesome trip!!! Your lens transported me this morning from the mountains to the sky blue waters of MN. Ahhhhhhh.... Other than the mosquitoes, I'm thinking sheer bliss. The person who invents the first successful anti-mosquito solution will win the Nobel Prize, for sure. :-) Really enjoy your lenses. I've been close. Went to Ely, MN last summer to the International Wolf Center. It sounds like a wonderful trip. I relate to the statement about mosquitoes; I was always eaten up as a child in the UP of Mich.
Great photos and great lens. Hi. Great lens. What a beautiful place. Hope I get to see it one of these days. Hi Deb. This looks like a great trip. I especially loved the photo taken at the overlook above Rose Lake! Congrats on the well-deserved purple star. The photos are amazing and it looks like a fantastic trip. Can you believe my husband and I grew up in MN and neither one of us have been to the boundary waters...it is ridiculous! 5* and fav'd! Superb photography and great presentation - I felt as though I was on the trip too. Congrats on the Purple Star. What a beautiful spot to canoe and camp! Congratulations on the Purple Star Award! My sister and I spent several days on Rose Lake a few years ago, getting into Arrow Lake on one lazy day trip and North Lake on another (where we had to pull out because there was a thunderstorm). The Rose Lake overlook is one of my favorite places in the world. We were hoping to go again this year, but The Economy intervened. Sigh. But thanks for writing so beautifully about my favorite place on earth! really great lens! I'm from central WI. 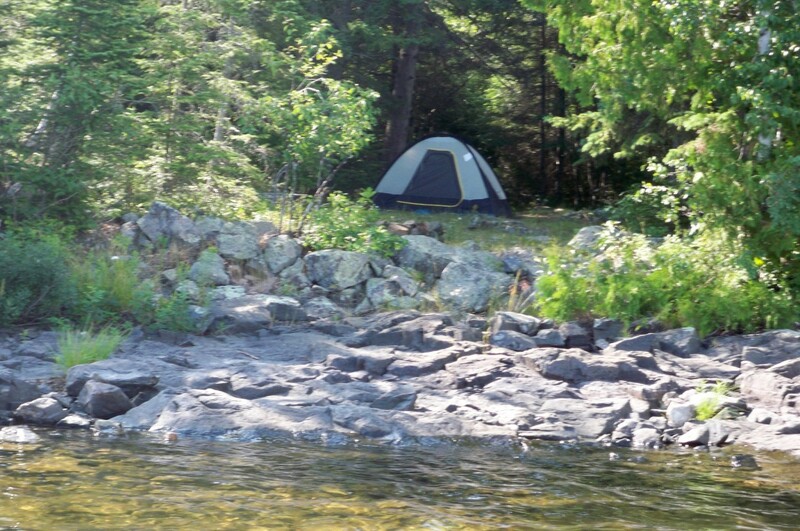 am mostly a whitewater paddler, but do some flat water river camping trips. have backpacked wind river range and grand canyon. love your sites! and thanks for your help at squidoo! I'll be following you! Oh Deb, this lens is so beautiful to visit. thank you so much for sharing your trip with us all. I love the articles you write to explain what's going on... A very nice place to visit, I have enjoyed it totally! Wow, what an incredible trip and wonderful photoblog of your trip. I have seen some of the photos at redgage.com but all of them are fantastic! I've enjoyed reading about your trip. You certainly have some interesting vacations! I'm not one to be without the comforts of home, but I enjoy reading about your adventures! Wonderful lens and photos, as usual! really a lovely lens. .thks deb, for sharing those beautiful pictures. Excellent lens and a great read. I would like to do a similar canoe trip sometimes. As a child I loved to read the stories about the discovery of the vast forests in Canada and about the life of the voyageurs (sp?). Thank you for sharing your adventure with us. Excellent lens RK. Sure is beautiful up there. Thanks for the report. What a wonderful trip and photos too, beautiful lens. It was the trip of a lifetime. Thank you for suggesting it. I'm so glad we went and can't wait to go back to do the Voyageurs Route. This looks like an amazing trip! Great photos. I haven't been this far up in Minnesota, I'd like to get there someday. Squid Angel blessed! What a great adventure you had! It was a fun read and I loved how you explained the various areas. The pictures are gorgeous! Excellent. A very good source page for any ones trip. Wow, this sounds like a great adventure. Your writing is wonderful, I almost felt like I was right there with you except for the mosquitoes! Beautiful photos!